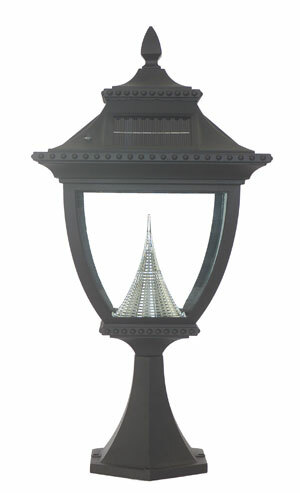 Add beauty to your deck, patio or pillar with this Pagoda solar deck post light, this solar light comes ready to install with a 6” base for mounting on any flat surface. With it’s super-bright LED's and special patented cone reflector will make your deck shine bright at night. Easy to install and no wiring needed, just place in a sunny location and let the sun do the rest. Made of powder-coated cast-aluminum and requires no maintenance and is equipped with a built in sensor to automatically turn on at night. With a convenient high/low brightness switch, you can choose between a brighter light or longer lasting solar light. The solar light will shine for up to 15 hours on the low setting and up to 12 hours on the high setting with a single day's solar charge. Durable, rust-resistant cast aluminum frame.